Bernie Sanders Talks With Kimmel About Brussels Attack, Trump & More | Jimmy Kimmel Live! Bernie Sanders dropped by Jimmy Kimmel Live on March 22, 2016 to chat with Jimmy on the same night of the Democratic primary results. Jimmy came prepared with questions about the Democratic primaries, Trump, climate change and the terror attack in Brussels. Bernie answered all of Jimmy's questions and didn't get off track when Jimmy compared the drama between Trump and Hillary to professional wrestling. Bernie talked about his campaign and receiving less media coverage because of his "focus on the real issues that impact the American people." 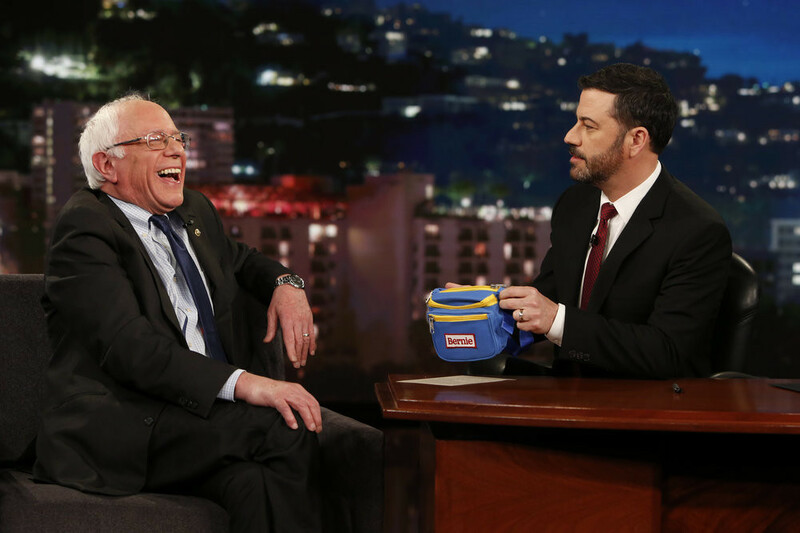 When discussing Hillary Clinton being backed by a Super Pac, Jimmy pulled out a special surprise for Bernie and gave him a fanny pack. Jimmy told Bernie, "I know you don't have a Super PAC but I just wanted you get you something...I did get you a fanny pack." Check out clips from Bernie's appearance below. Bernie may not have a Super Pac supporting him but Jimmy made sure he at least had a fanny pack to take home with him.